This dog is the perfect gift for someone you love! 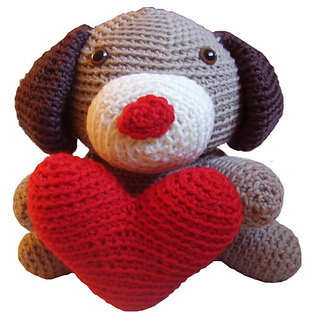 He’s an adorable pup, holding a giant red heart… perfect for Valentine’s day, or any other time of the year. Jeff measures 7.5 inches tall when completed. Alternately, you can leave out the heart, and you have a pattern for a regular pup! This is an intermediate pattern, as it requires some shaping. The pdf contains progress photos, and you can always email (stacey att freshstitches.com) for help!